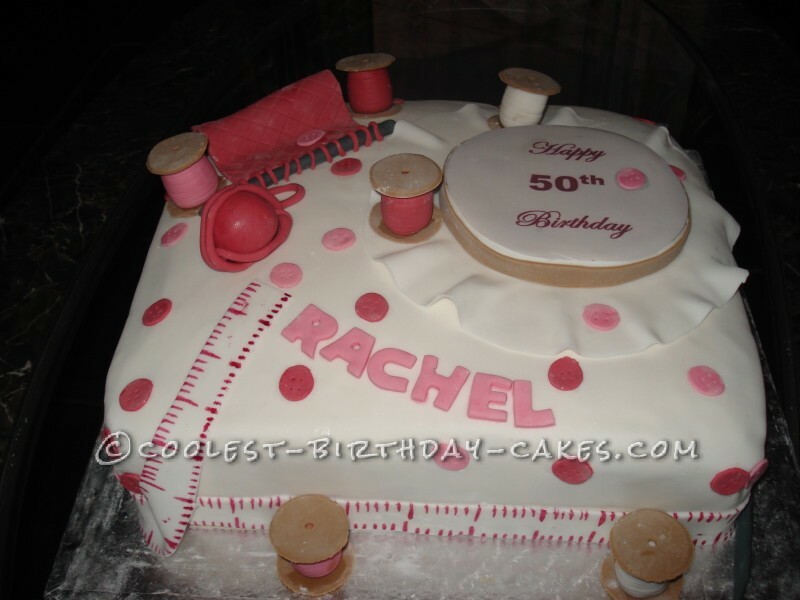 I made the toppers for this needlework cake two days in advance. At first I coloured my fondant the different shade of pink, including the maroonish pink, which I used even though the bottle states that it’s supposed to be red, but doesn’t turn out red at all, but it went very well with my colour theme. I made the thread holders out of plain fondant and used a kitchen knife to create the lines in the holder to resemble thread lines. I don’t have a bottom mold so I only used the cap of the colouring bottles circle and made holes with a tooth pick to resemble buttons. 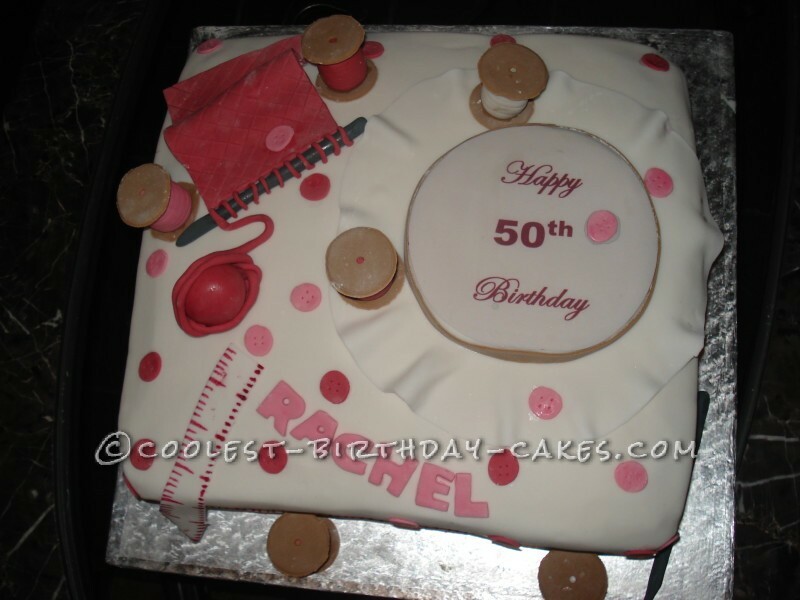 The happy 50th birthday is an edible sticker, cut in the shaped I needed it to be. The name Rachel I used my alphabet cookie cutters. 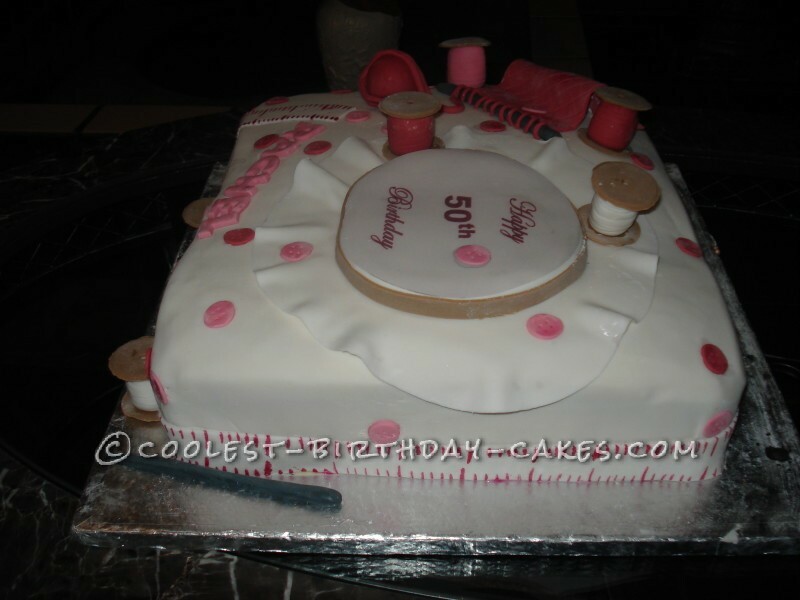 The measuring tape I made just before I put it around the cake to dry in the shape of the cake. I made the lines to appear to look like measuring tape makings, I used my red food colouring which is not actually red but a shade of pink with a fine paint brush to create the lines, and my food colouring was my ink for the lines. For the knitting pens I coloured my fondant dark gray and added some glitter to give them some sparkle. The little knitted cloth is also made before hand to dry in the shape as shown in the picture. The stitches where handmade, I just used water as my glue to stick what I needed to stick together. I baked three A4 sized vanilla flavoured cakes. Each cake recipe was doubled to give a nice big effect. The two A4 cakes I staked, one I halved in length to create a perfect squared cake, because I don’t own a square cake pan, which by the way in hard to find in SA. I shaped the cake to create a perfect square. 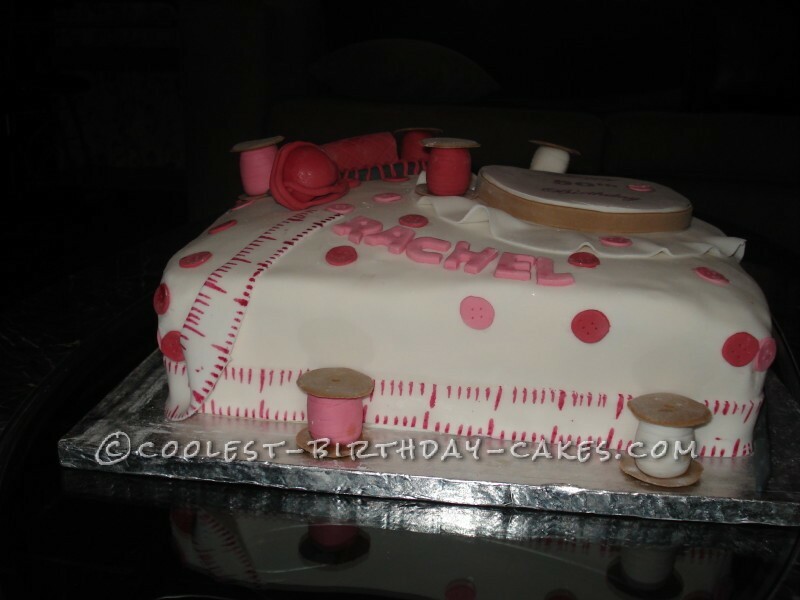 I covered the cake with butter cream icing and between the layers as well. 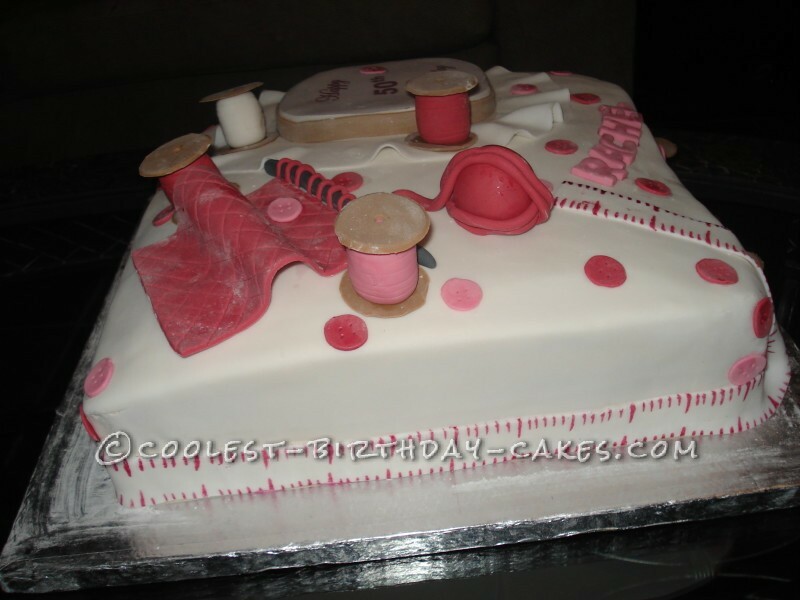 I covered the whole cake with white fondant. Placed my measuring tape as a border and added my toppers. A few days after my client gave the cake to her soon to be mom-in-law, she requested the recipe from me, because the cake was simply delicious and her mom-in-law loved it just as mush. I made this sunflower cake for my grandmother’s 80th birthday. Her favorite flower is a sunflower.